How to save all Path Finder application settings for use on my other Mac? I want to have a backup file that contains all prefs and settings for the Path Finder app, so that I can match all my preferred colors, font size, settings, configs, contextual menus, everything for installing onto a 2nd Mac. How do I do that? Is there an export/import settings feature? Or is this found within a System folder on my Mac (such as Application Support folders)? What is the best way to set up the "second Mac" to achieve a complete settings match to "Mac 1". After downloading and installing the Path Finder app onto the 2nd Mac, what should I do? There is no supported way to do so as of now. We've submitted preferences export and import as a feature request to our developers. Path Finder Support Team closed this discussion on 20 Mar, 2019 12:22 PM. it is so much of what I have wanted for a very lling time— ok, decades. would have expected but i see are not quite there. THAT's what I woiuld like the ability to replicate within Path Finder. to have present in the Sidebar. contextual menu option to view VIEW SETTINGS for any module. Thanks again for helpful support. Would you mind if we go through your suggestions one by one to check everything was understood correctly? 1) View setting for same or similar module. As far as I can tell you're referring to the module colors and visual appearance more than any specific layout or items in them, correct? And you would like to see something like, for example, modifying Path Finder colors affecting defaults for all modules, or ability to modify defaults for a module? Basically, you would like a module (which will be flexible in its size and placement like all other modules) which is just an empty space to stick apps, folders and other shortcuts? Similar to an isolated desktop in terms of file placement? We have received a number of requests to allow adding application shortcuts to the Favorites section, how does that suggestion feel? Simply add that behavior as an option. Path Finder Support Team closed this discussion on 21 Mar, 2019 11:17 PM. page it didn't indicate there was an expiration. Thanks! suggest optimizations to support your use. added to the next versions and updates! What are your top three to four features that you love and use often? Can you share a screenshot of the ways you have customized the interface? 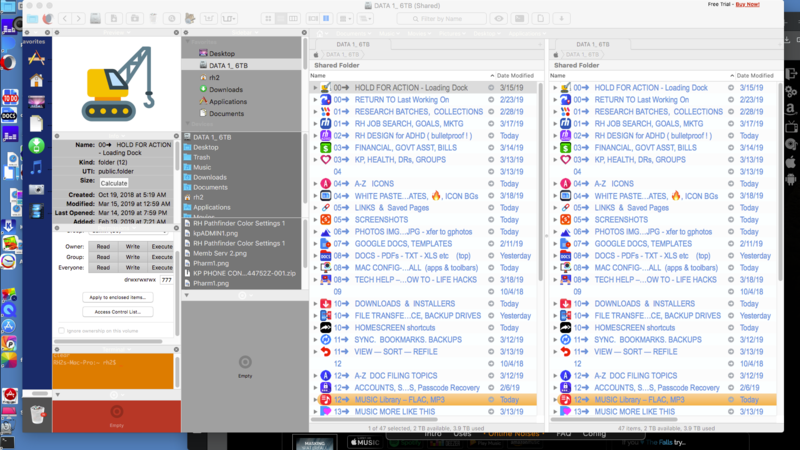 I began using it to re-arrange large media folders, it dragged like a dog. excellent, unsurpassed drag & drop features— leaves Apple in the dust. a new purchase or an upgrade! I have forwarded your email to our Sales Department. It may take some time to confirm the information with them. Once we do, we will get back to you. Meanwhile, don't hesitate to contact us should any questions arise. Path Finder Support Team closed this discussion on 23 Mar, 2019 06:06 PM. We are sorry but our survey has ended and the coupon code is now expired. Please follow us on Facebook and Twitter to further get informed about our upcoming promotions. Path Finder Support Team closed this discussion on 30 Mar, 2019 10:57 AM. pretty bad to take that hardline attitude when people give to the product. Because the email from Cocoatech that provided the coupon code did not say anything about an expiration date, Cocoatech should provide the discount. To impose terms and conditions that were not explicitly stated when the offer was made is wrong. Path Finder Support Team closed this discussion on 01 Apr, 2019 12:02 PM. I agree @dhnyny — it is very unprofessional for a company to do that. I actually took screenshots of that facebook page when I took the survey— just for this exact purpose. I never expected I would actually have to use it. The company is creating bad will, particularly when a user is contributing valuable screenshot-annotated feedback. As for the coupon code issue, our sales department is looking into this and we will follow up with you. Path Finder Support Team closed this discussion on 03 Apr, 2019 12:11 PM. After a detailed inspection, our sales team leader suggested that we create a free license for you. You've contributed a fair amount of feedback even besides the survey and we feel it's deserved. You should receive the email with your license info. If you don't, please create a new private discussion or email us at [email blocked]. Note that the code will have an expiration date in a few months (we aren't completely set on it yet) but it's fairly recent. Let me know here if you'd like to know the exact expiration date and I'll make sure to update you on that. Path Finder Support Team closed this discussion on 03 Apr, 2019 10:53 PM. Path Finder Support Team closed this discussion on 04 Apr, 2019 02:45 PM.